How many times have you been told to eat your fruits and vegetables? Well, I know I have! I’ve got a great cookbook for you if you’ve been told that and are struggling to work these items into your diet! Fresh from the Farmstand has 240 tasty recipes that use the freshest produce from backyard gardens or nearby farmers’ markets. They have made it super easy to buy local! On top of recipes you can make for dinner, there are also canning and freezing recipes and tips to help preserve the freshest flavors of the season. 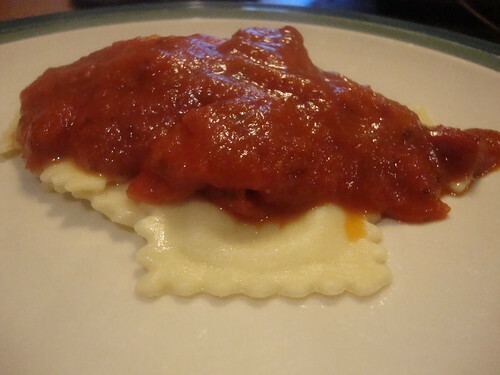 Some of my personal favorite recipes are the Cheesy Ravioli Bake, Quick 40 clove chicken (okay, that one is Bill’s), and my husband is also dying to try all the different salsa recipes in here! I love that the ingredients are things you should be able to find easily at the market or even your local grocery store. The spices are things you will have in your pantry too. The recipes in Fresh from the Farmstand are submitted by real people. If you are looking to eat more healthy this year, check out Fresh from the Farmstand for some great recipes! Off to find dinner! Cook and drain ravioli as directed on the package. Cover to keep warm. In a saucepan, heat spaghetti sauce, mushrooms, and pepperoni to boiling. Reduce heat to low. Simmer for 8-10 minutes. 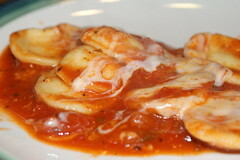 Stir cooked ravioli into sauce mixture and serve. Sprinkle with cheese. Ok, so I have really slacked on the Four Foods On Friday meme. However, I am back for this week. Here are my answers, but feel free to play along also. #1. Are your Kitchen utensils nylon, silicone, wood or other? Honestly, I have some of all of them. #2. Do you prefer dishes washed in a dishwasher or by hand? Dishwasher. I cannot stand washing dishes by hand. #3. How many sets of dishes do you have? 2. I have an extra set in the attic for when we have parties with everybody. #4. Share a recipe that calls for only one pot or pan. Preheat over to 375 degrees. 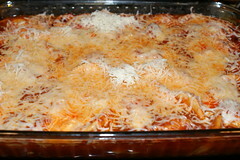 Combine spaghetti sauce, tomatoes, broth, and dressing in a 13×9 baking dish. Add ravioli and toss to coat. Cover with foil.